I've decided to delay my Hello Waffle Visage review until probably next week. My skin has been on the fritz and I really want to let it clear up before putting makeup on for my look. 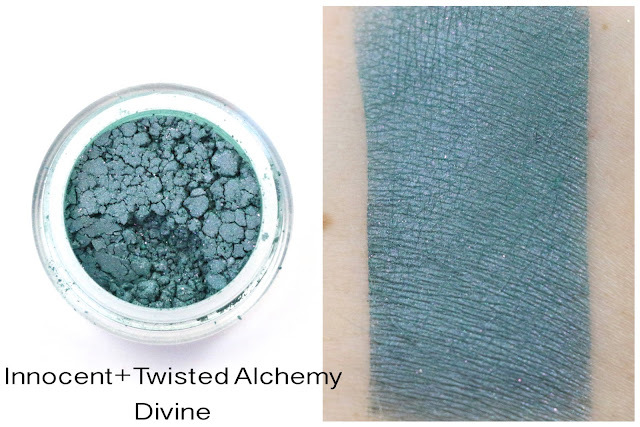 My Innocent+Twisted Alchemy subscription arrived this month, and I was pretty excited to see another Angelic Powder! And I just loved how the eyeshadow colors matched the label artwork colors on the jars. About - Innocent+Twisted Alchemy is based in California, owned by Linda, and specializes in eyeshadow and blush. Many of their collections are inspired by anime, but they also have the "Live Or Die" collection which is inspired by the Saw films. IT+A also has a monthly subscription, that comes in sample or full size form. Shipping - My subscription this month was shipped on the 13th, and arrived 2 days later via USPS from within California. Product Size - I subscribe to the mini subscription, so my products are minis. 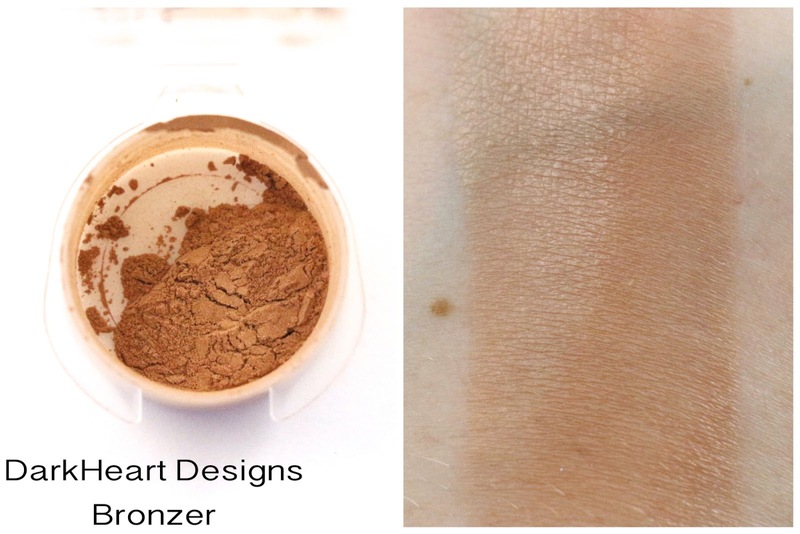 Free Samples - We received two free samples this month, a bronzer and an eyeshadow. 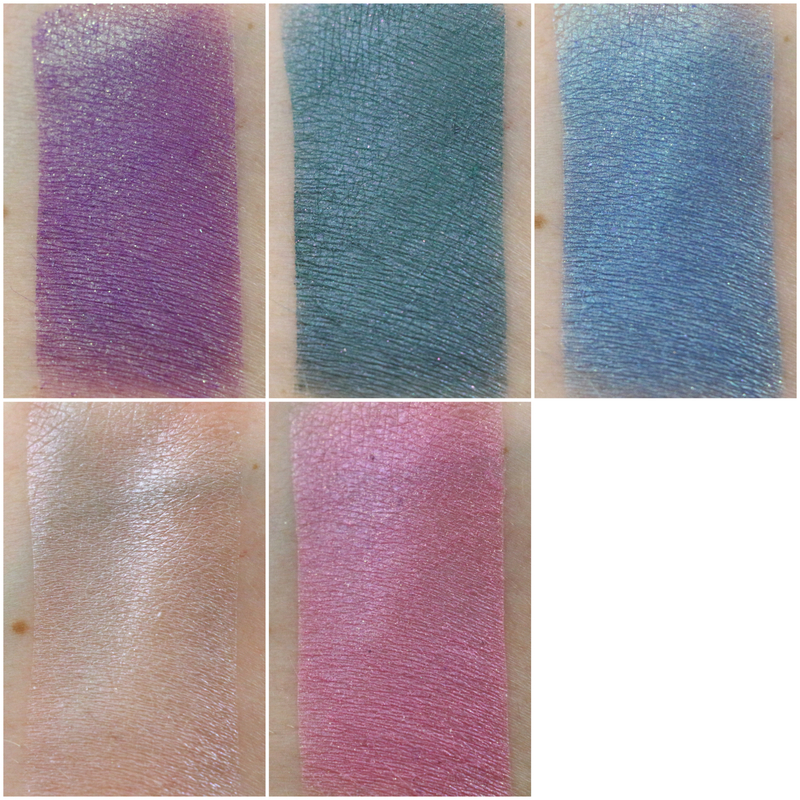 All eyeshadow swatches are done over Too Faced Shadow Insurance primer. Highlighter and bronzer swatches are done over bare skin and blended out. 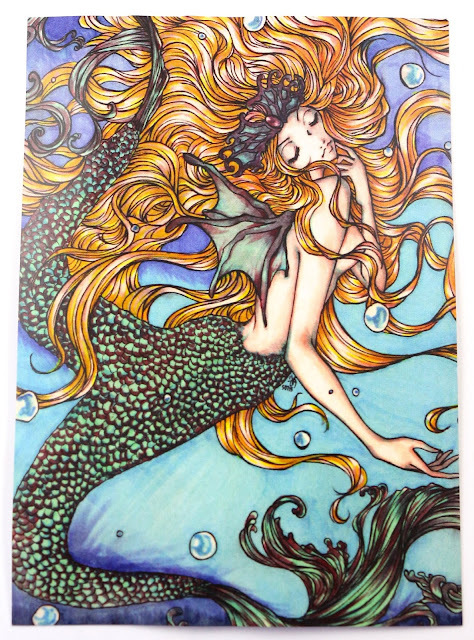 The info card this month, and the theme is inspired by a character Linda created years ago. The character's name is Ethereal, and she's supposed to be the goddess of the universe. 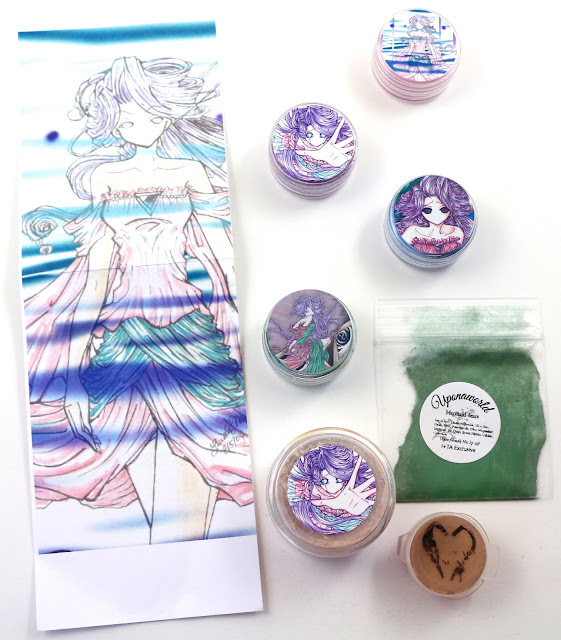 We also received a small print of the artwork Linda did for this month's Aromaleigh Ephemera subscription, which I reviewed here. I have a few other makeup related prints, I can't wait to frame them all, along with this one! This is a light purple with green sparks and a green sheen. It was a tad bit sheer, but nothing too bad. 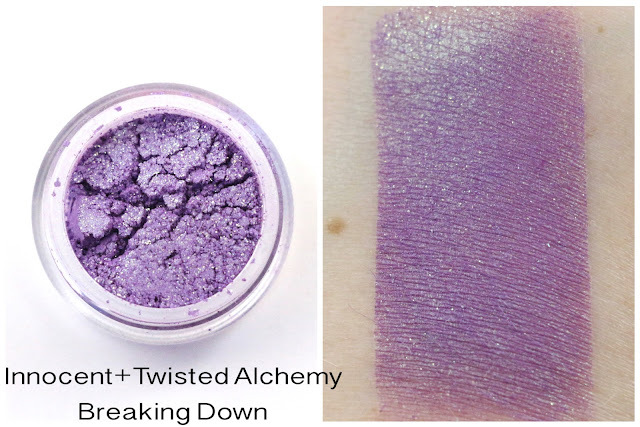 The one thing I noticed that I really loved about the colors this month, is that they matched the label art colors! That will make it really handy for trying to remember what the colors were when I see the label art in my drawers. This is a lagoon blue/green with what looks like pink sparkles. I actually don't think I have anything like this in my collection, so it will make a nice addition. This is a pale icy blue with silver sparkles, and a bit of a green sheen. This is another Angelic Glow, which is a highlighter. 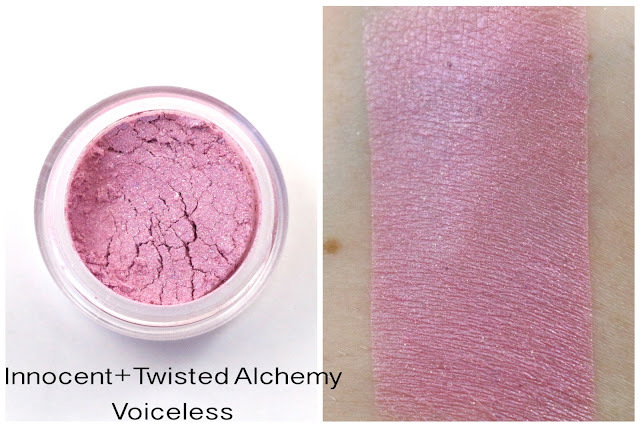 It's a very soft pinkish cream shade, with a great sheen. I love really subtle highlighters as I'm still fairly new to using them. This is a soft pink with tiny silver sparkles, and a subtle sheen. This one was also a bit sheer and patchy, but again not too bad. I've never heard of, or tried this brand before. And I don't see a bronzer on their website. But this is a really warm brown shade, and it's something that I don't think will work for my skin tone. Plus, the container was a bit unwieldily it's so top heavy that it kept tipping over. This was an exclusive shade created for the subscription from Uponaworld. It's quite pretty, it's a green with a golden overlay and gold sparks. Very nice, and I bet it would look even better over a sticky base. Overall, I liked the very cool toned shades we received this month. 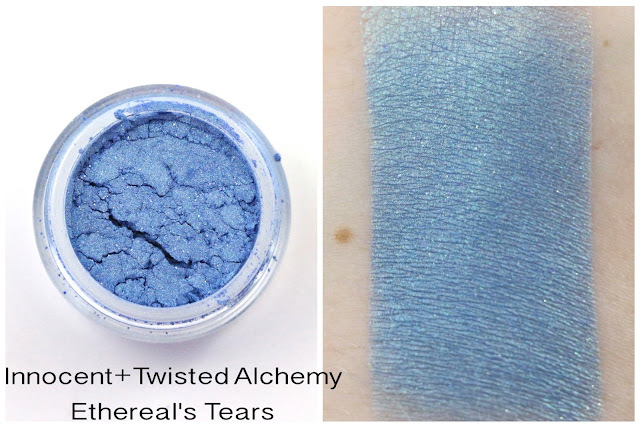 I also loved that they matched the label art colors, and that we got another Angelic Powder. 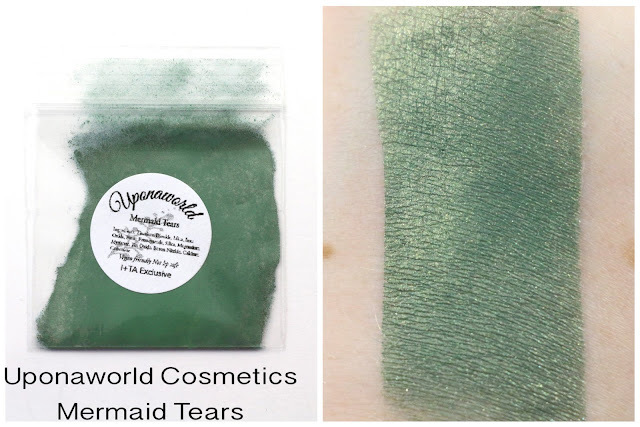 I didn't care for the bronzer extra, but the Mermaid Tears shadow was very pretty. 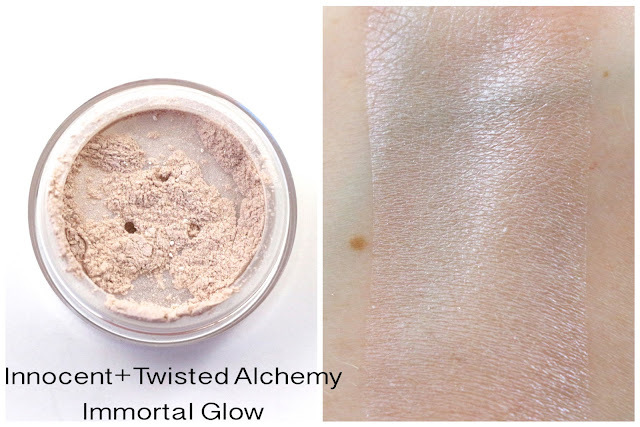 I think my favorite products this month were Divine and Immortal Glow. One thing I want to note though is that the jars have been really full lately. And that's awesome, I love getting a lot of product, but they seem to leak and spill more often than not now. You can see it in my photos, it gets all over the rim of the jar. Just something to note. I would love to be able to try a blush some month, I know Linda makes some blushes on her site, it would be awesome to try one sometime. Availability - This subscription goes up around the 1st of the month to subscribe, so just check the Facebook page for exactly when that happens. Overall Satisfaction - My favorites this month were Divine and Immortal Glow. I'm already looking forward to seeing what July's subscription has in it! I'd absolutely love to see a blush as well!! I hope one makes an appearance one month!